Math was one of my favorite subjects to teach and is something that I find easy to incorporate into My Obstacle Courses with Andrew. 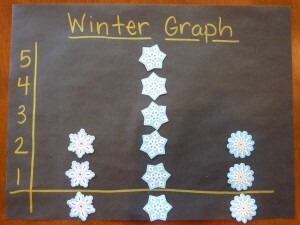 One of my favorite station activities is graphing. 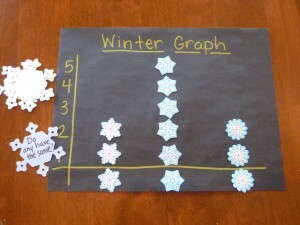 This one activity builds many different skills – sorting (visual discrimination), arranging (fine motor skill), counting (math), and answering questions using the graph (problem solving). 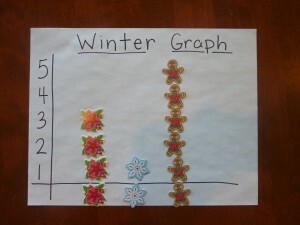 We have made graphs with all sorts of different things and when I found these mini-cutouts I knew they would not only make this easy for me but there were so many in the package that we could do lots of different graphs showing different results. 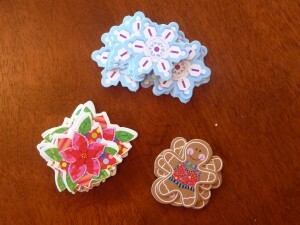 These were my favorite and I used to be able to get them at my teacher supply store but haven't been able to find them lately. They worked well because they were small, bright and blank. I did find these at the teacher supply store. 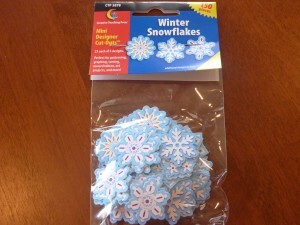 The package has three different kinds of snowflakes and the backs are blank. These were some that I got for our Christmas themed My Obstacle Courses, but I can still use two of the three patterns for my winter themed graph. I would combine the cutouts and use these if I was working with someone who had trouble with visual discrimination. These cutouts are a bit more difficult because they have similar coloring. I would use these with children who are working on this sort of visual discrimination. 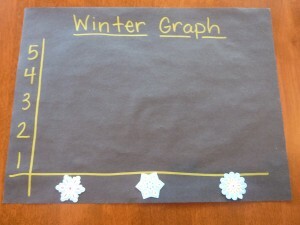 Creating A Graph Doesn’t Have To Be Anything Fancy! 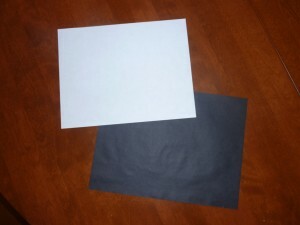 Here are the materials I used to make these activity stations: paper, cutouts, markers (a gold photo marker for the black paper). and glue. 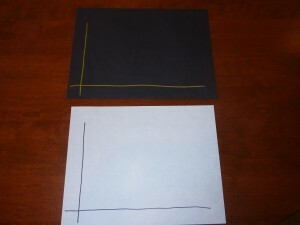 Draw a line down the left hand side (y-axis) and along the bottom (x-axis). 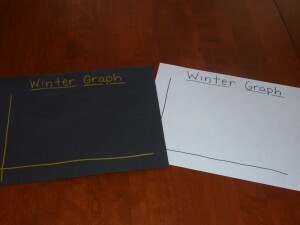 The paper could be turned to make the graph the other way as well. Write and underline the title. 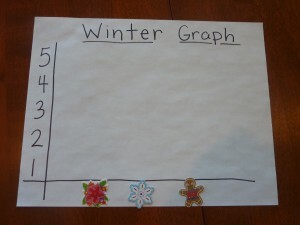 My graph is ready! The numbers are on the side and the cutouts are glued on the bottom. Note: Make sure your numbers are about the same size as the cutouts or it may cause confusion if the number doesn't line up with the item amount. The other graph numbered and labeled. 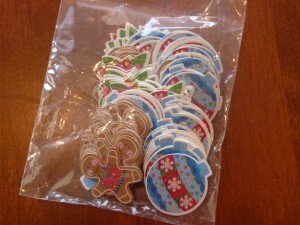 I choose how many of each specific cutout I want to have in the graph and place them in a container (small plates, cups or cupcake foils work great for this!). That’s all the preparation necessary for this station! When the child gets to this station, they will sort the cutouts into the correct row. 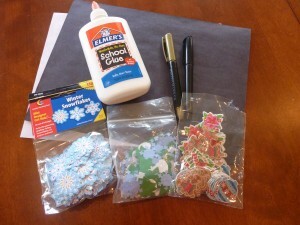 Gluing is not necessary but if you want to work on that skill, the pieces can then be glued in the row. The child counts how many in each row. 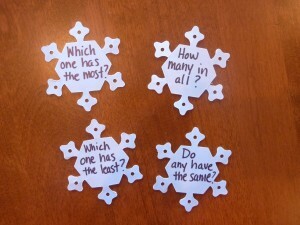 Incorporate math vocabulary and answering questions either by asking your own questions or by using question cards. Calendar cutouts used as question cards. Which one has the most/greatest? Which one has the smallest amount/least? Do any of the rows/cutouts have the same amount? The child flips over the card, reads (with assistance if necessary) and answers the question. 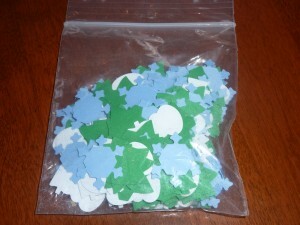 The level of difficulty can be adjusted and if you have a child who is ready for more representational thinking, you could have each cutout represent a given amount (ex. 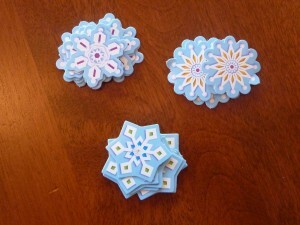 one snowflake cutout=10 snowflakes falling), even cutting snowflakes in half to make it more challenging! I encourage you to have fun doing math with your child. It doesn’t always have to be scary and boring. 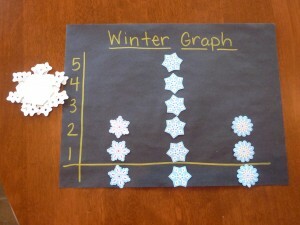 This is such an easy thing to do and the finished graph looks cool hanging on the refrigerator or pantry door!